Professor Ron Wood's Traditional Punch and Judy Show is available to hire for Family Fun Days, Corporate and Community events in Yorkshire, County Durham and the North East. If you want a show that is suitable for all ages then Punch and Judy is the perfect choice. Children love Punch and Judy as do many adults. Each show lasts from 15 - 30 minutes as required. You can have up to four shows in a consecutive four hour period. Shows can be varied by changing some of the characters and routines. Punch And Judy is ideal for your Family Fun Day, Corporate, Council or School Event, Show, Gala or Open Day. 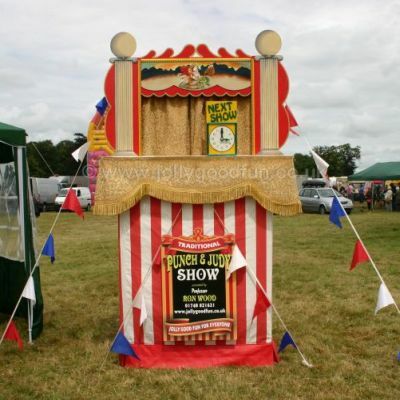 The Jolly Good Productions Traditional Punch and Judy Show comes with a large colorful puppet theater which will stand out and look impressive at your venue. The puppets are high up so if you have large crowds everyone can easily see and enjoy the show. You don't need to provide anything as the show is self contained and even has it's own portable pa system. 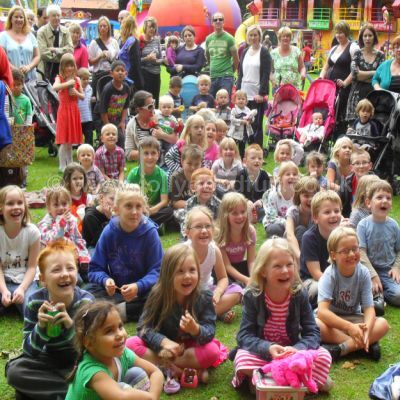 Punch and Judy makes perfect entertainment for your child's Birthday Party. Our Punch and Judy Birthday Party lasts for two hours. Your children will have lots of fun with Magic and Balloon Modelling before the puppet show begins. You can expect lots of excitement during the show as children love to watch the antics of Mr Punch and his friends. Be prepared for some very noisy audience participation. Following the Punch and Judy Show the children have their party food. Your Birthday Party ends with a further thirty minutes of exciting entertainment before the children go home. What makes a good Punch and Judy show? Punch and Judy is lots of fun and booking the right show is important! Beautiful hand carved wooden puppets. Fast moving and funny show. Lots of good old fashioned knock about fun. Cast of well known characters. Distinctive voice of Mr Punch using the swazzle. Puppets that come to life in the hands of a very experienced performer. You don't need to worry about an electric supply either as the Punch and Judy Show has its own portable pa system run off a 12v battery. The Punch and Judy Show originally came to England from Italy in the mid seventeenth century. It was performed first in London and then at country fairs, markets and on the streets throughout the land. It was particularly popular with the working classes and was watched and enjoyed mainly by adults who could not afford to go to a proper theatre. The rebellious nature of Mr Punch and his confrontations with those in authority appealed to the poor and downtrodden in society. The first record of a Punch And Judy was made by Samuel Pepys who saw performances in Covent Garden, London, in 1662. At that time the puppets were marionettes.The English showmen changed Mr Punch's costume from white to red and yellow, the traditional colours of the English court jester and he became the glove puppet we know today. In Victorian times seaside holidays were invented and Mr Punch achieved fame entertaining children on the beach at every popular seaside town. Punch and Judy became associated with the seaside and was as essential as ice cream and donkey rides. Punch and Judy was a much loved childhood memory for generations of children from the Edwardian period right through to the nineteen sixties when cheap air fares and package holidays caused the decline of the traditional English seaside holiday. Although his audience had moved to warmer climes Mr Punch was not forgotten. He remained in people's hearts and his services continue to be called on at birthday parties, shows and events. Today the internet is helping to raise his profile and revive his popularity. Mr Punch is our national puppet. He is part of our culture and heritage. Jolly Good Productions are proud present their traditional Punch and Judy Show to help keep keep this wonderful tradition alive. Watch a video clip of the Jolly Good Productions Traditional Punch and Judy Show, performed by Professor Ron Wood. Ron with Mr Punch at Brodsworth Hall, West Yorkshire. Ron with his favorite Mr Punch puppet. Excited children totally involved and loving every minute of the show. Mr Punch with Judy and the baby. Authentic hand carved puppets. Over 50,000 children have delighted in Professor Ron Wood's Punch and Judy Show which has travelled throughout the UK over more than twenty years.